The warm sunny weather has many flocking to the beach, but as the Fourth of July holiday weekend approaches, officials in Florida are warning beachgoers of an unpleasant organism lurking in the water along part of the coast. On Tuesday, Pensacola Beach Lifeguards posted a warning on Facebook noting that there were purple flags along the beach to caution swimmers of the presence of sea lice. Dave Greenwood, director of public safety for Pensacola Beach, told the Pensacola News Journal sea lice are actually tiny jellyfish larvae and jellyfish cells. “They aren’t very intense, which is why we call them sea lice and not sea hornets or sea wasps,” he said. The organisms are common on beaches in the area during summer when the water is warm, he told the newspaper, but they cannot live outside of salt water. Other nearby Gulf Coast beaches in Florida and Alabama are not currently affected by sea lice, AL.com reports. 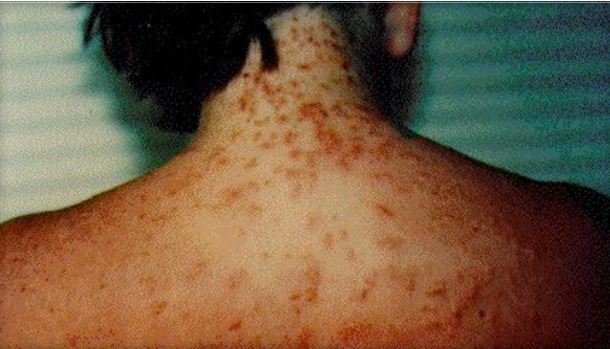 According to the Florida Department of Health, sea lice, also called thimble jellyfish, can cause dermatitis, or small red bumps on a person’s skin. The condition usually appears between four and 24 hours after exposure, but some people may feel a “prickling” sensation while in the water. In some people, the rash may be accompanied by symptoms of nausea, vomiting, diarrhea, headache and muscle spasms, and they may have trouble sleeping. Sea lice are barely visible to the naked eye. The organisms tend to get trapped between swimmers’ bathing suits and skin where friction can cause their cells to “fire,” or sting. Certain activities increase the likelihood of getting stung, including contact with a surfboard, lying on the beach, or sitting on a car seat in a wet bathing suit during the trip home. The surface area of a bathing suit may also increase the area over which someone can get stung. Female swimmers wearing one-piece suits and children and adults wearing T-shirts in the water can be at risk of a more severe reaction, the Florida Department of Health says. Treatment for dermatitis caused by sea lice can include an antihistamine, such diphenhydramine, an over-the-counter hydrocortisone cream, calamine lotion, or an oatmeal bath. If you know you’re at risk of coming in contact with sea lice and have had a severe reaction in the past, confine your beach activities to land, or use a pool instead of risking it by taking a dip in the ocean. If you’re taking a dip in the ocean, remove your T-shirt before going swimming. Since sea lice sting humans when they are trapped beneath clothes, women and girls may be better off in a bikini rather than a one-piece bathing suit in the water. Take your bathing suit off immediately after ocean exposure. Shower off loose larvae to limit the number of stings. Once you take off your swimsuit, thoroughly wash it with detergent and heat-dry it to ensure you don’t have any recurring symptoms next time you wear it.